Key Points: Climate change, including sea-level rise, threatens to inundate Kiribati or contaminate the scarce fresh water resources. Adaptation and mass migration from the islands are two plans to deal with change, but require considerable education and planning efforts. The United Nations Intergovernmental Panel on Climate Change predicts that sea levels will rise by about 50 cm (20 in) by 2100 due to climate change, and a further rise could occur as well. For low-lying nations like Kiribati, within a century, the nation's arable land will become subject to increased soil salination, groundwater could become salinized and non-potable, and the nation could even become largely submerged. Think about that: Kiribati is thousands of km from any “large islands” and so the only source of fresh water is local ground water. On low-lying atolls, especially narrow ones like Kiribati which may only be 100 m across, these fresh ground water lenses are small and shallow, and sit on salt water. They can be easily polluted. Similarly, any sort of exceptionally high tide (“king” tides) or storm surges can inundate the islands, and ruin the water by mixing in sea water. On Tarawa Atoll, for example, the combination of a 25% reduction in rainfall and 50 cm of sea level rise is expected to reduce the size of the freshwater lens by 65%. This reduction is superimposed on the sanitation issues described elsewhere. “Migration with Dignity” – the notion that relocation or migration of the entire people of the nation may be inevitable. To quote the government’s web page: “The relocation strategy of the Kiribati Government has two key components. Firstly, opportunities must be created to enable the migration of those who wish to do so now and in the coming years. This will assist in establishing expatriate communities of I-Kiribati, who will be able to absorb and support greater numbers of migrants in the longer term. It will also benefit those who remain by lifting the levels of remittances. Secondly, the levels of qualifications able to be obtained in Kiribati will be raised to those available in countries such as Australia and New Zealand. This will make qualified I-Kiribati more attractive as migrants, but will also improve the standards of services available locally. Goals for Good Foundation's scholarship initiative is consistent with these missions. 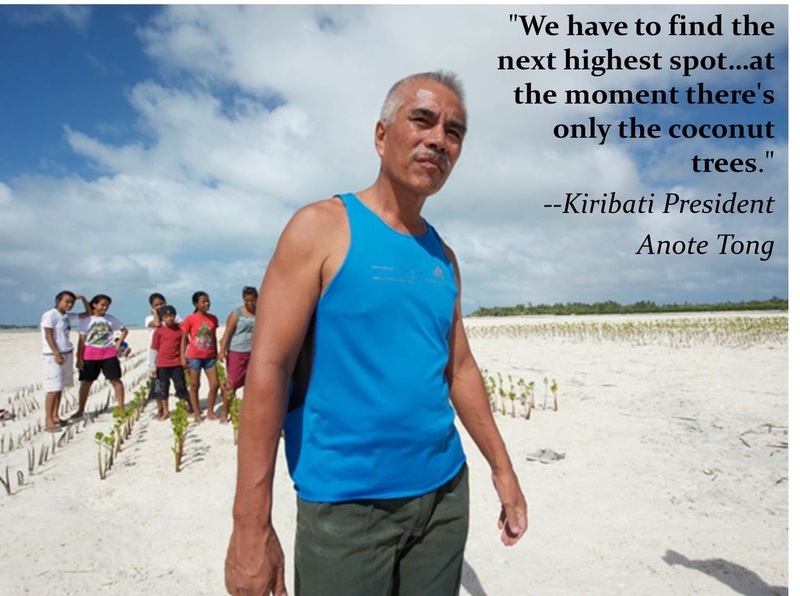 The Kiribati government has already purchased 6,000 acres of land in Fiji (a 3-hour plane ride away) as “insurance” for food security, and, as necessary, as a go-to haven should seas rise too much.